I’m writing to you to share with you a little bit about the unprecedented events in Wisconsin, and to ask how you might like to make a presence and show of solidarity with brothers and sisters to the north. As you probably know, the Tea Party-backed recently elected Governor, Scott Walker, introduced a sweeping anti-labor, anti-family and union-busting budget last Friday afternoon, hoping to avoid public discourse and using a trumped-up fiscal crisis as his excuse (http://host.madison.com/ct/news/opinion/editorial/article_61064e9a-27b0-5f28-b6d1-a57c8b2aaaf6.html). He did so with no warning, and refused all negotiation on his measure. In addition, he made a menacing and disturbing suggestion that he would send out the National Guard on citizens rightly incensed by the dismantling of their collective bargaining rights, among _many_ other hard-earned benefits and protections. Since Monday, tens of thousands of school kids, college students, teachers, state workers, firefighters, retirees, and concerned citizens of all ages and backgrounds have poured into the State Capitol building, with thousands testifying to keep the bill from leaving the Joint Finance Committee (it passed along strict party lines, despite the citizens speaking out overwhelmingly against it). People have been sleeping in the Capitol for the past few nights to keep the building open. And now, in the most dramatic turn of events yet, Senate Democrats have LEFT THE STATE to prohibit a quorum, effectively stalling the vote on this bill (http://www.ssdc-wi.org/SSDC/Home.html). Rep. Tammy Baldwin, D-WI, recently released a brief video (http://www.youtube.com/watch?v=hpwiSlcxvxw&feature=player_embedded) encouraging the constituents of her state, but warning that this legislation is the TIP OF THE ICEBERG – this is exactly what Speaker Boehner has planned for the entire nation. What happens in Wisconsin is critically important to the whole country, and to all of us at state universities, in particular, nationwide. The University of Wisconsin’s TAA (http://taa-madison.org/) staged a walk-out yesterday and today. People are arriving from all over the state and from neighboring states to offer support and to put an end to this union-busting before it goes any further. IF WE DO NOT DEFEAT THIS MEASURE in Wisconsin, we can be assured that the Congressional leadership, emboldened by their “success,” will push this anti-labor agenda at the highest levels. We _must_ show solidarity with WI TAs, grad employees, and all public and civil servants being threatened by this draconian measure. Are you a member of a union? Encourage your membership to author a statement of support. Beyond that, consider mobilizing members interested in coming to Madison for the weekend or for the next few days? 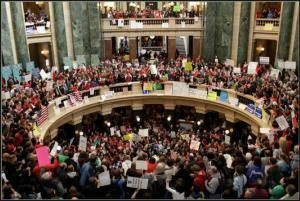 We could work on arranging lodging/food/etc., connect up with Wisconsin TAA, have sleepovers at the state Capitol…just showing up in numbers is what is needed now. These measures will not stop at the state line. We need to lend our voice – and more – to this effort. Please, let’s find a way to help.